COMMERCIAL MIXER, 8 QT. WITH GUARD, KITCHENAID. 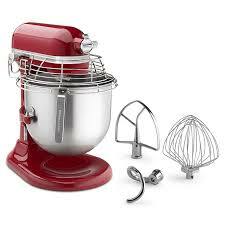 KitchenAid Commercial 10 Speed Bowl-Lift Stand Mixer w/ 8 qt Stainless Bowl & Accessories. #KSMC895DP - DARK PEWTER. #KSMC895ER - RED. Notify me of updates to COMMERCIAL MIXER, 8 QT. WITH GUARD, KITCHENAID.